Inspired by the bagatelle games of the 1800s, which were derived from billiards and became the ancestors to what we now know as pinball. Play a little bit of pinball history. Bagaball is free of flippers, bumpers and ramps. Control the ball launch to land in the highest scoring pockets. 2x capture hole – the hardest shot on the table. The ball has to not only roll over it, but also move slowly enough to stick. It’s all about finesse. 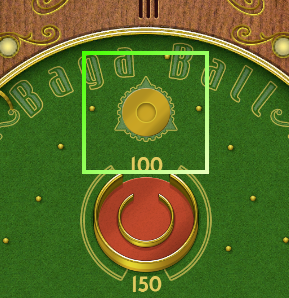 Careful not to knock it out with a subsequent ball because if there is a ball in the 2x capture hole at the end of the game, the total score for the game doubles.